Kirk Douglas took the stage of San Francisco’s Castro Theatre on Sunday, July 24 at the San Francisco Jewish Film Festival, to an extended standing ovation. No surprise there. The 94-year-old actor is, after all, one of the very last classic Hollywood stars still living. But the applause wasn’t just for the 87 movies, 10 plays, and nine books Douglas has to his name or for his very survival, his having survived a 1991 helicopter crash and 1996 stroke that left him with impaired speech. He is the SFJFF’s Freedom of Expression award winner this year, feted not for being a movie star, but for his pivotal role in ending the Hollywood blacklist of the 1950s when he insisted that Dalton Trumbo attach his own name to his screenplay of Stanley Kubrick’s 1960 historical epic Spartacus. So Douglas turned to Trumbo, a member of the Hollywood 10 who had 11 spent months in prison for contempt of Congress for his refusal to discuss his political associations with the House Un-American Activities Committee and had subsequently found himself unemployable in Hollywood – at least under his own name. Writing under pseudonyms, his scripts for 1953’s Roman Holiday and 1956’s The Brave One were both Oscar winners. 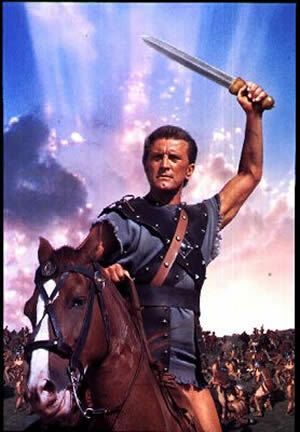 “Sam Jackson” was the name that he was going to use for Spartacus, but despite being warned that his own career might suffer if Trumbo received screen credit, Douglas insisted on standing on principle. “I think if I was 10 years older, I might not have done it,” Douglas told Stein. “When you’re young and impulsive … I just had to do it. I’m glad I did it now. To close out the Freedom of Expression event, the SFJFF screened Spartacus.